Taking a break from the happy news of my new foster pup and my beloved two other dogs to acknowledge the devastating blow that has been dealt to dogs less fortunate throughout the state of Maryland. On April 26, the Maryland Court of Appeals rendered a decision in the case of Tracey v. Solesky that says pit bulls and pit bull-mix dogs are inherently dangerous animals. Previously, and currently for all dogs other than pit bulls, if your dog bit someone you could only be held strictly liable if the dog had bitten someone before--in other words, if you knew the dog was dangerous and didn't take precautions. Now, if your pit bull or pittie mix dog bites someone, you can be sued because you should have known that the dog was inherently dangerous--it's a pit bull, after all! Note, this decision does not have a huge impact on you if you own a pit bull and own your own home. 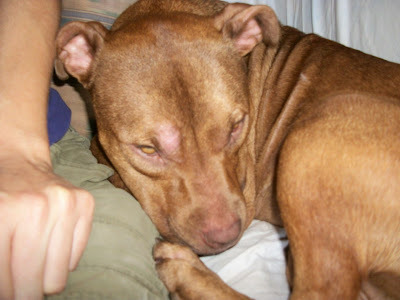 As long as your dog doesn't bite anyone, this decision does not affect your right to have a pit bull-type dog. But it is devastating news for pit bulls not lucky enough to live in homes owned by their lovers and advocates. For those who languish in shelters in Maryland--whose situation was already dire--this decision means death is far more likely. 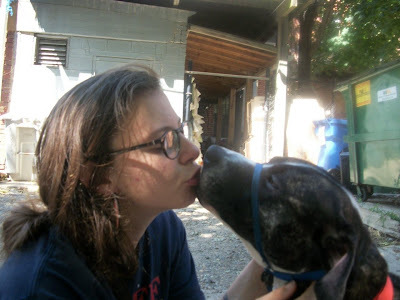 Shelters and rescues will not want the liability of adopting out an "inherently dangerous" dog, and many landlords will insist at first opportunity (when the lease is up) that pit bull type dogs not be on the premises. Fortunately, pit bulls have strong advocates in this state and they are working to undo this ruling. For updates, check out the terrific group B-More Dog, the same group that holds monthly pit bull walks in Baltimore. Their Facebook page is being updated regularly with the latest on this ruling, the opposition to it, and what you can do to help. In the meantime, hug your pit bull and tell him or her that you'll never allow him to be in a situation that puts him in danger. If you live anywhere outside of Maryland, please consider volunteering to transport and foster a pit bull or pittie mix from a MD shelter. Let's save as many lives as we can until this terrible ruling goes away. Labels: pit bulls, Professional boat-rocker, Why foster? Blanket laws are stupid. We are all inherently dangerous and capable of causing harm. Will we (as humans) never be able to accept the responsibility of having created the fighting dog and give it a fair go at another way to live? Too sad. These laws are so freaking stupid! I saw (I can't remember where) a saying that said, "Punish the Deed and Not the Breed." Doesn't that make more sense? I am absolutely disgusted with hearing this negative media in the news. Why can't we as humans for once in our existence stand up and take responsibility, innocent dogs are being labeled and banned for our doings. I know I'm preaching to the choir, I'm so outraged. Kudos to you for posting this. Let's get the word out and revoke this new law. Hi Kirsten, I'm willing to bet real money or in my case, a bison rib bone, that more people have bitten by other breeds than by pitties or pittie-crosses. It really comes down to how well that dog has been raised and socialized by its peoples when it was little and how its been raised and trained since. My mom and dad have met pitties, mastiffs, and rotties that were the friendliest and happiest souls around. Of course, there are ones that were not as fortunate in their upbringing, socialization and training but that's applicable to all breeds and mixes. Blanket laws don't work. Generalizations whether they are applied against people or dogs is just dumb. This is sad news indeed! Thank you for mentioning B-More Dog, our group was originally founded to beat back BSL legislation in Baltimore County in 2007. We will need everyone's help to work on this again. Thank YOU for all your work organizing! So glad I got to meet you with Chris and Sandy that day. You guys are doing amazing work. This ruling is so sad! 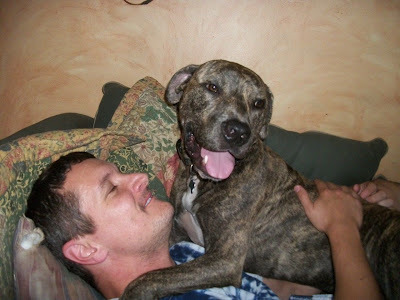 I hope pit bull advocates are able to come together to fight this....in the meantime, I am hugging my Turkey very tight! It makes me insane - for every step we take forward, someone pushes us two steps backward. It's so frustrating! It is indeed insane, heartbreaking and frustrating. However, the rallying of the pitbull and dog advocate community has been nothing less than inspiring. Kirsten, thank you for posting a pic of Sandy that is new to me (sleeping on Fozzy's leg). I could NEVER thank you enough for pulling her out of the DC shelter and fostering her when death was hours away and "imminent". I can't thank YOU enough for being absolutely the adoptive home Sandy was meant to go to, and providing her more enrichment and joy than we ever dreamed of! Give her a big smooch for me and I hope I can find a way to visit one a these days! So sad to hear the news. Unfortunately it will affect homeowners as well. A few homeowner's insurance providers (State Farm is one) don't practice breed discrimination in writing their homeowner's insurance policies. But they will react to state legislation. Glad to hear Marylanders and Baltimoreans in particular are fighting the good fight.